Mixed martial arts fighter Conor McGregor has appeared in a Brooklyn court to answer to assault and criminal mischief charges after he allegedly went on a caught-on-camera rampage after a UFC 223 press conference at Barclays Center, the NYPD says. Erica Byfield reports. Mixed martial arts fighter Conor McGregor has appeared in a Brooklyn court to answer to assault and criminal mischief charges after he allegedly went on a caught-on-camera rampage after a UFC 223 press conference at Barclays Center, the NYPD says. He appeared in the packed courtroom alongside another MMA fighter Cian Cowley, 25, of Ireland, both in handcuffs, to face a judge Friday afternoon after spending the night in jail. The judge ordered them to stay away from several men they allegedly assaulted in Brooklyn the day before, including fellow fighters Michael Chiesa and Ray Borg. McGregor received a $50,000 bail package that would let the Irish fighter reclaim his passport, provided he checks in with his bail bondsman weekly. 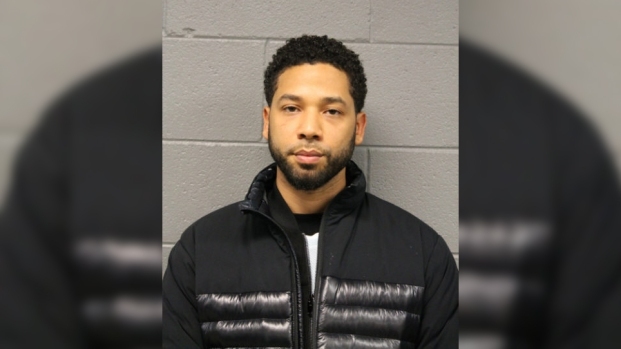 His attorney assured the judge he is not a risk, saying, "He's the most visible face on the planet and he has no criminal record... the bail package is completely appropriate." Cowley got a $25,000 bail package. The two men, who are next scheduled to appear in court on June 14, said nothing as they left court to a packed crowd of reporters, fans and spectators outside and got into a white SUV that whisked them away. The bail package for both fighters was secured by high-profile bail bondsman Ira Judelson. Several hours later, UFC released a slickly produced video showing the rampage from several camera angles, including from inside the bus. 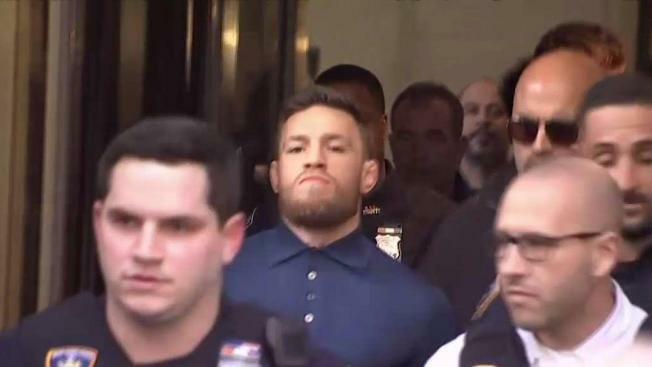 News 4 cameras were at the scene for the first footage of McGregor as he was led from a Brooklyn police precinct Friday morning en route to face a judge. The handcuffed fighting champion said nothing, but held his chin up as police escorted him to a waiting vehicle. His arrest comes after multiple social media accounts captured video of him acting wildly in a non-public area of the arena. One video showed McGregor picking up a metal guardrail and running with it in an apparent attempt to throw it at a departing bus carrying several other fighters including rival Khabib Nurmagomedov. McGregor allegedly continued flailing other items around and ultimately launched something that hit the window of the bus, cracking it and shattering the glass, video taken from inside the bus shows. Michael Chiesa, another UFC fighter who was set to compete in the weekend's events, had minor injuries. A source close to McGregor told News 4 that he was "upset and distraught" following the episode. The NYPD said McGregor has been in custody since late Thursday. Earlier the department said it was looking to question the fighter about the exchange and added that one man was taken to the hospital with broken glass on his head and possibly in his eyes. UFC President Dana White -- who earlier this week announced that McGregor was being stripped of his UFC lightweight championship -- told MMAjunkie in a Facebook interview that McGregor and a crew of about 20 men "stormed" the building after gaining access from media-credentialed people at Barclays and got to the loading dock, where fighters were boarding buses after a press conference for Saturday's pay-per-view card. "They started to attack the buses, throwing trash cans and dollies and things like that -- broke one of the windows and cut Michael Chiesa really bad. He cut his head, he cut his face," said White, adding that other people were injured. "Obviously everybody's shaken up... this is the most disgusting thing that's ever happened in the history of this company," White said. White added McGregor would be "sued beyond belief" and that it was a "real bad career move on his part." "It's disgusting," he said. "I don't think anyone's going to be a huge Conor McGregor fan after this." "The police are going to take care of Conor," White said. "The police are gonna handle Conor." In a statement, UFC called the disruption "completely unacceptable," and is "working on the consequences." Later, Chiesa tweeted he had been pulled from UFC 223 bout against Anthony Pettis by the New York State Athletic Commission. "I’m devastated to say the least," he said in the tweet. UFC confirmed Chiesa was pulled from the event after he suffered "several facial cuts." The UFC also said another fighter was injured and is unable to fight. "Flyweight Ray Borg, who was scheduled to face Brandon Moreno, was deemed unfit to fight as well due to multiple corneal abrasions," UFC said in a statement. It's not clear what McGregor was doing in New York or at Barclays Center; White speculated that he may have been in town to watch the upcoming fight Saturday. The popular Irishman is tight with UFC 223 fighter Artem Lobov, who was involved this week in a scuffle in a hotel with Khabib Nurmagomedov. The fight between Max Holloway and Nurmagomedov was canceled Friday when Holloway didn't make weight for the main event, a lightweight championship left vacant by McGregor. White said this week in New York that McGregor would fight again for UFC this year. McGregor's actions now put future fights in doubt.